Review in English and Spanish (below)English“The Internationalists” is a history of international laws on war. Steven Pinker recommended it as “one of the most important books on war”. I think Pinker is too honest an intellectual to say something like that about a book only because he is quoted in it, so I’ve read it.The book’s provocative thesis is that the Kellogg-Briand pact of 1928 changed the world. Usually this treaty, also known as the Pact of Paris, is taken as a failed treaty in which the powers renounced to the use of war as a method to resolve disputes, and then, not much later, managed to tangle themselves in the Second World War. However, according to the authors, the Pact laid the seed for a slow revolution in international law, and brought about the change from the Old Order, systematized by Hugo Grotius, in which war was legal; conquest was legitimate; gunboat diplomacy was binding; and “neutrality” meant not to take sides even in commerce; to the New World Order in which we live now, and in which war is illegal; conquests are not recognized; and aggressions are fought with increasingly intelligent economic and trade sanctions. A system that is not perfect, but that works considerably better than the old one, as the authors prove quite convincingly.Another idea of the book that seems important is that the dilemma is inescapable, and we have to choose. International law is a system. You can’t take a bit from here and a little from there and keep the better rules. War can either be legal or illegal. And each of the two alternatives inexorably leads to a different system, with all its sub-rules. The only alternative to the current system would be a world government, and that too has its risks and would also work imperfectly (although the authors do not dwell on that issue).Also, the number of sovereign states is increasing, in part because with the New Order that the illegalization of war has brought, states no longer have to be big and powerful to be safe, and, contrary to what one would think, that leads to less INTERstate wars, but more INTRAstate wars (civil wars and secession processes).The heroes of the story are the internationalists, lawyers and diplomats who acted behind the scenes for a better world, and that until now had kept themselves below my radar, but whom I have come to admire deeply: Salmon Levinson, James T. Shotwell, Sumner Welles, and Hersch Lauterpacht. They attained their objective in successive small steps and, notwithstanding their historical importance, it’s the first time I hear their names. One of the objectives of the authors is to rescue them from oblivion.The book is very well written and enjoyable. The passages about Carl Schmitt, the nazis and the Nuremberg trials were amazing. At the end there are some statistical graphs about war. There are extensive references and bibliography, but no index.A good book. Recommended to those who love history and are interested in international relations.Español:“The Internationalists” es una historia de las leyes internacionales sobre la guerra. Steven Pinker lo recomendó como “uno de los libros más importantes que se han escrito acerca de la guerra”. Creo que Pinker es un intelectual demasiado honesto como para decir algo así de un libro sólo porque le citen en él, así que me lo he leído.La provocativa tesis del libro es que el pacto Kellogg-Briand de 1928 cambió el mundo. Habitualmente este tratado, también llamado Pacto de París, se toma como un tratado fallido en el que las potencias renunciaron al uso de la guerra como método para resolver disputas, para poco después meterse en la Segunda Guerra Mundial. Sin embargo, según los autores, el Pacto sentó la semilla para una lenta revolución en la legislación internacional, y provocó el cambio desde el Viejo Orden, sistematizado por Hugo Grotius, y en el cual la guerra era legal; la conquista era legítima; la diplomacia de trabuco era vinculante; y la “neutralidad” obligaba a no tomar partido ni siquiera en el comercio; hasta el Nuevo Orden en el que vivimos ahora, y en el que la guerra es ilegal, las conquistas no se reconocen; y las agresiones se combaten mediante sanciones económicas y comerciales cada vez más inteligentes. Un sistema que no es perfecto, pero que funciona considerablemente mejor que el antiguo, como los autores demuestran de manera bastante convincente.Otra idea del libro que me parece importante es que el dilema es ineludible y hay que elegir. Las leyes internacionales son un sistema. No se puede coger un poco de aquí y un poco de allá y quedarse con lo mejor. O la guerra es legal o es ilegal. Y cada una de las dos alternativas lleva inexorablemente a un sistema distinto, con todas sus subreglas. La única alternativa a lo existente sería un gobierno mundial, y eso también tiene sus riesgos y también funcionaría de forma imperfecta (aunque los autores no se meten más en ese tema).Además, el número de estados soberanos está aumentando, entre otras cosas porque con el Nuevo Orden que ha resultado de la ilegalización de la guerra, los estados ya no tienen que ser grandes y poderosos para estar a salvo, y, contrariamente a lo que podría pensarse, eso lleva a menos guerras INTERestatales, pero a más guerras INTRAestatales (guerras civiles y procesos de secesión).Los héroes del relato son los internacionalistas, letrados y diplomáticos que actuaban entre bastidores en pro de un mundo mejor, y que hasta ahora habían permanecido por debajo del alcance de mi radar, pero a los que he acabado admirando profundamente: Salmon Levinson, James T. Shotwell, Sumner Welles, y Hersch Lauterpacht. Consiguieron su objetivo en pequeños pasos sucesivos, y pese a su importancia histórica, es la primera vez que oigo sus nombres. Uno de los objetivos de los autores es rescatarlos del olvido.El libro está estupendamente escrito y es muy ameno. Los pasajes sobre Carl Schmitt, los nazis y el juicio de Nuremberg son impresionantes. Al final hay unas gráficas estadísticas sobre la guerra. Hay extensas notas y bibliografía, pero no tiene índice.Un buen libro. Recomendado para aquellos a los que les guste la historia y estén interesados en las relaciones internacionales. 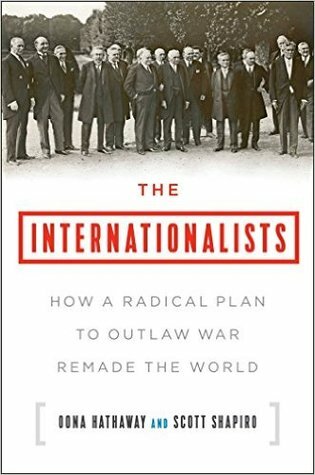 The Internationalists is the work of two Yale Law professors, Oona A. Hathaway and Scott J. Shapiro. So we can make some off-the-bat assumptions here: a) it's dense, b) it's well-researched, c) it's both an intellectual and legal history, and d) it weaves both historical narrative and analysis. This book is a history of the outlawry of war. In short, their argument posits that nation-states operated in a "might is right" world and waged war on each other to settle disputes prior to the Kellogg-Briand Peace Pact of 1928. This "Old World Order" is detailed in the first third of the book. After 1928, states operate/d within the international community whereby breaking laws (aggressive war, etc.) found the violator outcasted from the privileges of the community (including what we know colloquially as sanctions, particularly economic). This "Transition" from Old to New is the second third of the book. The "New World Order" preoccupies the last third, detailing on issues such as the Islamic State, Russia's "annexation" of Crimea, and China's claim on islands in the South China Sea. The End of Conquest chapter details the methodology and data sets that Hathaway and Shapiro used, which found 254 cases of territorial changes as a result of militarized conflict between 1816-2014 and discovered that "Conquest, once common, has nearly disappeared. Even more unexpected, the switch point is that now familiar year when the world came together to outlaw war, 1928." (313)If you want an overview but not the whole cookie, the Conclusion chapter does a fantastic job of not only summarizing the findings, but placing a call to action to preserve international legal order because current internal and external forces are pressuring the system (rising nationalism, isolationism, etc.). I can't recommend this book to the general reader, and international legal specialists are already aware of the arguments presented by the authors. Those with an interest in international affairs and diplomatic history, on the other hand, will find the work fascinating and possibly revelatory. As for me, this is probably the most important book that I have read in the last decade.The authors document the evolution of international affairs from the time of Grotius to today by focusing on the transformation of the laws of war. Simply put, war was legal and central to the relations of states before 1928, but has been "outlawed" thereafter, resulting in unanticipated and unintended changes to the entire body of international law. Before the often maligned and ridiculed Kellogg-Briand Peace Pact, war was the basic organizing principle of world affairs and laws were derived therefrom. Conquest, "gunboat diplomacy," lawful mayhem, and the strictures of neutrality were derived from the privilege of states (and sometimes non-states) to use force (p. 97). Once states agreed to abandon the use of force as an instrument of national policy, however, conquest necessarily became illegal, aggression became a crime, coerced agreements were unenforceable, and the strictures of neutrality gave rise to the right to sanction states for illegal actions (p. 304). In other words, strong states were forbidden to prey on weak states, allowing a dramatic increase in the number of sovereign states since World War II.The rise of new states helped achieve self-determination for billions of previously oppressed people, but it also created a few problems, notably "failed states," which serve as nurseries for transnational insurgencies and conflict (e.g., "terrorists"). It also generated new conflicts within states, even as it reduced conflicts between states. Indeterminate borders left by withdrawing imperialists and the achievement of statehood without authentic nationhood have produced extreme ethnic conflict and atrocities that perplex the world and strain the effectiveness of international organizations like the United Nations.Part of these problems can be explained by the fact that the full legal implications of the post-Peace Pact world have yet to be understood and codified by the family of nations. It can also be explained by the reluctance of some strong states to honor the legal rights of weak states. In particular, the five Permanent Members of the UN Security Council have wielded their veto to protect themselves and their clients, reluctant to forgo their strength in cases where the rights of the weak are at stake, and undermining the purposes of the very institutions that they created in 1945. Although war is illegal, "self-defense" is not, creating a loophole that strong states have abused as a way of masking their lawless behavior (e.g., the U.S. invasion and occupation of Iraq in 2003, Russia's invasion of Georgia in 2008 and annexation of Crimea in 2014, China's ongoing seizure of "islands" in the South China Sea).The post-Peace Pact world also faces existential challenges from Islamism, which rejects the very notion of sovereignty based on the consent of the governed. In response, states have applied force instead of reaffirming and upholding territorial sovereignty as the organizing principle of the modern world. By so doing they have created martyrs and new recruits dedicated to abolishing the rights of individuals under law.Hathaway and Shapiro ask whether the post-Peace Pact world is worth saving, given that the strong remain determined to trample on the rights of the weak. Donald Trump's "America First" makes no room for international organizations like the U.N., which his supporters view as a means by which the weak handcuff the strong. The framers of the U.N. Charter, fresh from the horror of Nazi Germany's aggression against the weak states in Europe, intended the organization to be a shield for those unable to defend themselves. Conservative complaints about the "failure" of the U.N. are actually complaints about its "successes," few in number and tepid though they may be.The authors' answer, of course, is "Yes." Readers may come to their own conclusion. I, for one, believe in a world where the weak can flourish alongside the strong. Too many of my fellow Americans, however, clearly believe the answer is "No." What might replace the postwar world order seems beyond their imagination or even contemplation, as long as Trump "Makes America Great Again." Such an interesting book, would you believe war was actually outlawed in 1928? Neither would I, yet it happened. The Peace Pact as sign in that year. We we still have war, your might ask, WWII or Vietnam comes to mind. Prior to 1928, war was legal. If one country invaded another, it was legal and both sides, win or lose, were treated the same regardless of who the aggressor nation. The side who won the war gained legal title of the vanquished countries territory, resources and wealth, along with property and the people. After the Peace Pact that all changed. Countries defeating another are not internationally recognized to "own" the defeated country. How? I suggest you read this well researched and well written book. The best written book I've read all year. I think it's a great history of the intellectual ideas surrounding interstate conflict between early modern Europe and now. I think its apparently claim that ideas matter more than power is unconvincing, and its analysis of the decline of interstate war is overly simplistic. It's very short discussion of the problems of terrorism doesn't fit well with the rest of the book and is underdeveloped. But it's still a superb read; I enjoyed it so much. In 'The Internationalists,' Hathaway and Shapiro make an impassioned argument for the institutionalist school of thought on why there has been so little inter-state war since 1928. They argue that the often-overlooked or trivialized 1928 Kellogg-Briand, or 'peace' pact, is responsible for the long period of peace which we now enjoy. To paraphrase, war is now infrequent because we outlawed it.The book is interesting, but Hathaway and Shapiro make their case a bit too vigorously, taking some aspects of their argument too far, and overlooking significant events during the period that they cover.The early portions of the book are devoted to Hugo Grotius, who they contend was the forefather of international law in the old world. They also contend that he helped create a legal framework for war, and their scholarship on him really did change the perspective of the Dutch lawyer that I gained from the undergraduate international law. On the other hand, their contention that Grotius somehow 'saved' the legitimacy of war in his age, as opposed to being credited with attempting to circumscribe its bounds, seems somewhat far-fetched. Was war really under any particular threat in 17th century Europe?Their treatment of WWII in eastern Europe was particularly problematic. Hathaway and Shapiro contend that the signing of the Kellogg-Briand pact in 1928 is more important that more-often cited agreements between the allies in 1944 and 1945 because most of the territory that the Axis seized was returned to the states that held sovereignty in 1928.They neglect however to explain how this squares with the Soviet Union's participation in the Molotov-Ribbentrop pact in 1938 in spite of their acceptance of the Kellogg-Briand pact. Whatismore, their contention that the Soviet Union took few gains from Eastern and Central Europe strains credulity.Overall, I found this book to be very worth reading because it will likely drive the debate over international conflict for years to come and rightly so. At its best, 'The Internationalists' is an interesting exploration of how power shapes law, and the more novel subject of how law shapes power on the international stage. I have studied international law in depth for years, and this book took all of the fun bits and put it together while making a very compelling case for the changing world order since 1928. It is tightly written, interesting, and should be required reading for those who think that international law isn't a thing. Most important book about the World Order that I have read. This book is utterly transformative. The level of detail with which Hathaway and Shapiro approached their task in writing The Internationalists is spellbinding. Not only did they produce a great deal of empirical data, but the book also is sprinkled with asides such as this: "As Nishi Amane would later explain, defending one's borders "is like riding in a third-class train; at first there is adequate space but as more passengers enter there is no space for them to sit. "I learned about how piracy by the Dutch East India Company accidentally led to the modern emergence of international law; how "gunboat diplomacy" wasn't always so metaphorical; how international legal scholars were responsible for many of the political decisions of the twentieth century; how the United Nations Headquarters is located on the former site of a slaughterhouse; and innumerable other curiosities of world history.This book is not only fascinating in its academic detail, but it itself is a powerful tool for understanding the world in which we live and the international legal order. The authors make no secret of their views on international law and this book may be able to persuade international law sceptics the world over. By the end of The Internationalists, one is encouraged to follow Robert Jackson, a man who served as US Solicitor General, US Attorney General, Associate Justice of the SCOTUS and Chief US Prosecutor at the Nuremberg Trials, who declared in 1945 that he was joining those who held an "inveterate belief that international law is an existing and indestructible reality ... in a timely and resolute confession of faith". This book was a fascinating and unique overview of international history, borders, war and peace from a global perspective. It provides great insight into why the borders on our modern day maps look the way they do today and how we arrived at the international laws that we have today. It puts modern politics and 20th century into perspective. Very glad to have read this. Can’t recommend it enough. This is not a history book. It is a beautiful theory on international law or international relations. Easy to read and beautifully writen too, but untruthful in historic terms. The main thesis states that the Briand-Kellog Pact of 1928 succeeded in the way war has been considered afterwards. After it, all wars have been considered to be illegal. If we just consider for a moment the 70 million of violent deaths that happened just a decade after and the cruelty of wars such as Korea, Vietnam of Irak in recent years, the whole point of the book does not hold. It oversimplifies the distinction between the Old World Order (apparently based just on Hugo Grotius) and the New World Order created after the Kellogg-Briand Pact. After the New World Order, for example, wars of conquest have simply dissapeared. The book does not establish a logical casuality between facts and ideas (setting unfulfilled and forgotten laws as a revolutionary change in History). Based in contrafactual story, it denies reality. Every fact in the book is used with the sole purpose of defending his thesis. But do not let History ruin a good Theory. Amazing. I never knew that war was outlawed internationally in 1928. Anyone who wants to really understand where we are at risk of losing our grip on the New World Order needs to read this book. Very essential. I will not spoil anything by listing the top five outlaws, oh no; I insist that you read this book yourself and be enlightened. An interesting review of history from a perspective I'd never considered before. I'm glad I heard the Lawfare podcast interview with the authors, because it led me to this.I've read a lot about WWII over the years from several angles, but never from the angle of the legality of the underlying war. The book is about the renewed appreciation of the idea of outlawing wars in the international system. I buy it. Could have been half as long and still be effective. Very interesting history of the legality of war. Excellent! Very informative history of war and international law. A must read for IR students and for all of those who are interested in war outlawry and international relations.